Items available in our nursery retail center. We now offer, by popular request, our own Tropical Bamboo Fertilizer. This special mix has been formulated for use on most tropical, clumping bamboo species and has a 90 - 120 day, time release polymer coating so you can apply it once to four times per year, depending on how much you want to 'push' your bamboo. A handy tool to measure your bamboo culm diameter - The Tropical Bamboo Measuring Caliper. Easily record the progress of each year's new growth. Made of durable plastic, measures diameter in inches and centimeters. By popular request, we now offer our own soil amendment in 50 lb.bags. It should be mixed with the Florida sand/soil that's typically great for drainage but poor in nutrients. When planting your new bamboo, dig the hole and mix this natural compost with the sand from the hole. Backfill with the enriched mixture and you've created the perfect soil environment for your bamboo. 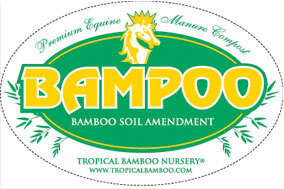 BamPoo© is fully-composted horse bedding (manure and pine shavings). It is black and odor-free with a neutral ph. Top dress with our Bamboo Fertilizer, add your favorite mulch, and your bamboo plant will be ready to do what it does best... GROW FAST! We will mail the Gift Certificate with a note indicating the gift was from you. You can use your Gift Certificate ID in the Shopping Cart upon checkout or in person at the nursery. If you are REDEEMING a Gift Certificate, Enter your Gift Certificate ID and click on the image, in the shopping page of this site or you can also just begin shopping and use your Gift Certificate ID in the Shopping Cart upon checkout. We accept Master Card, Visa, Discover, PayPal, & American Express . Checks, should be made out and sent to Tropical Bamboo, Inc.
Cash payments should only be made in person at the nursery.